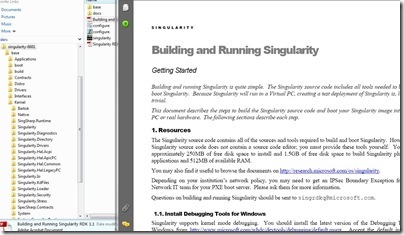 For all those source code kids – the sourcecode of Singularity – the research operating system written by people at Microsoft Research completely in .NET is now available. “Singularity is a research project focused on the construction of dependable systems through innovation in the areas of systems, languages, and tools. We are building a research operating system prototype (called Singularity), extending programming languages, and developing new techniques and tools for specifying and verifying program behavior. Advances in languages, compilers, and tools open the possibility of significantly improving software. For example, Singularity uses type-safe languages and an abstract instruction set to enable what we call Software Isolated Processes (SIPs). SIPs provide the strong isolation guarantees of OS processes (isolated object space, separate GCs, separate runtimes) without the overhead of hardware-enforced protection domains. 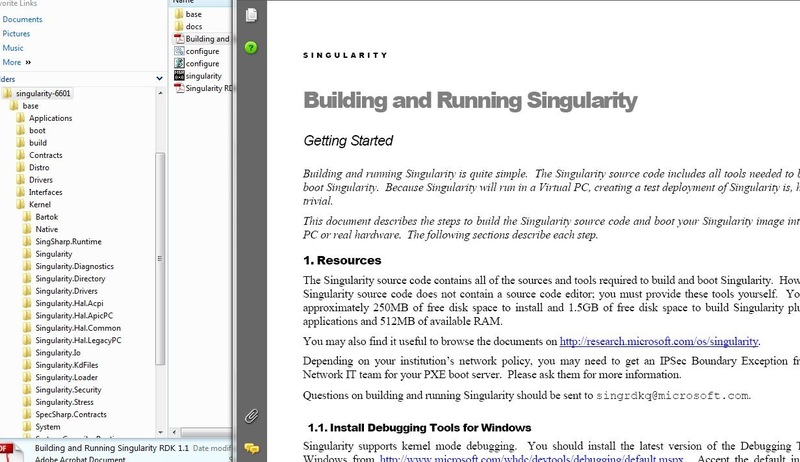 In the current Singularity prototype SIPs are extremely cheap; they run in ring 0 in the kernel’s address space.